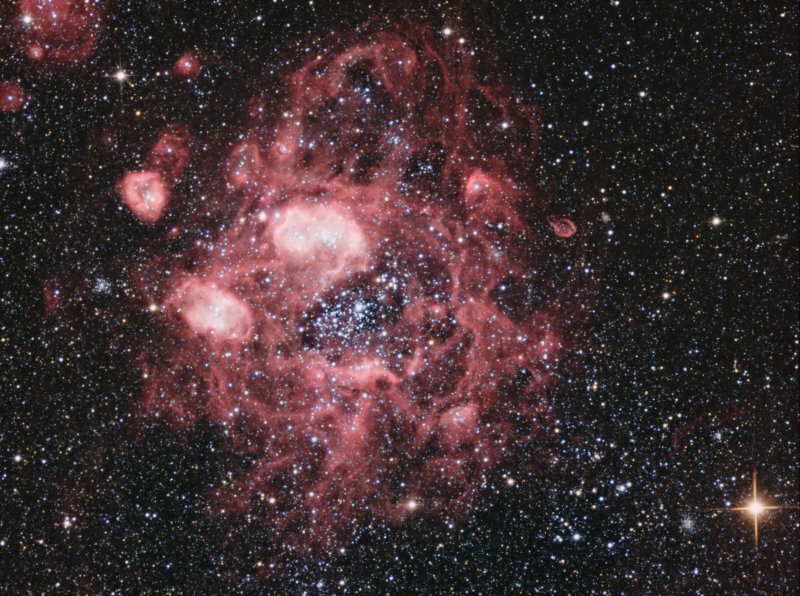 NGC1760 is a giant star-forming complex in the Large Magellanic Cloud, a satellite galaxy of our Milky Way. It is about 1,000 light-years across, and is one of the biggest objects of its kind (for comparison, the Great Orion Nebula is only 24 light-years wide, but is much closer to us). It is a huge ring of gas, the centre has been hollowed out by a cluster of hot blue supergiant stars, and more star-formation is happening in the bright knots of gas around the ring. There are some other interesting features, including some other star clusters, an unusual tadpole-shaped bubble of gas (supernova remnant? ), and even a few background galaxies. I had an unusually good run of clear skies in Sydney, giving me the chance to image the same object over 3 separate nights, this is an amalgamation of about 6 hours of data across all CCD filters. * LRGB roughly corresponds to the visual appearance - the hot blue stars and clusters dominate the scene along with millions of other stars in the LMC - and the deep red of the hydrogen is relatively dim except in the brightest knots of nebulosity. * Hydrogen Alpha captures the emission of the hydrogen gas, using a 12nm hydrogen alpha filter. This shows the structures of the gas rings and bubbles much more clearly. * Ha-LRGB is a combination of all the data. It's a compromise between the brilliance of the hot blue stars, and highlighting the gas clouds, and it creates a colourful scene.